Living in an area steeped in the history of "Victoriana," combined with an artistic eye, inspiration and a dash of whimsy, you've got the creativeness of Kit Haskell. Kit Haskell, the artist behind Paint Illusions, grew up in San Francisco from the age of 9. 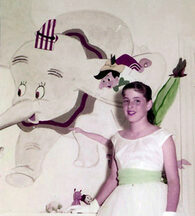 Kit began her "career" as a muralist at the age of 10 when she painted Disney cartoons on her bedroom walls. 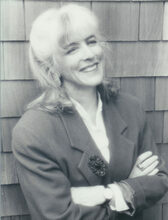 She went on to receive her BA in art from San Francisco State University. Kit feels she creates her "magic illusions" with a paint brush in much the same way as her father, a famed magician, created his magic with a deck of cards. In addition to her successful art work, in 1981 Kit expanded her talent to the lens of a camera and established "Photo-Links." This is an international genealogical research group which "links people to their heritage through photography." In 1986 Kit began a series of pen and ink line drawings for the Victorian Alliance Of San Francisco and has done the drawings for their successful home tours ever since. This popular series has been printed on note cards, mugs, and other marketing materials throughout the years. Today you can see these drawings on the website for this non-profit organization which is committed to the preservation and restoration of Victorian and other historic structures. Kit returned to her art work in 1989 and has became her own artist/manufacturer. 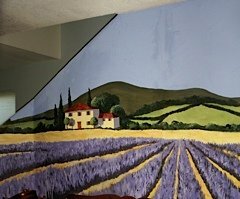 Her company, "Paint Illusions", specializes in faux finishes, murals, painted furniture, sky ceilings and trompe l'oeil. Kit has worked extensively in the San Francisco Bay Area from San Jose to St. Helena. She has also been commissioned to work her "magic" in other parts of California and many preeminent cities throughout the United States. Kit has been commissioned to do work in Italy and Germany.